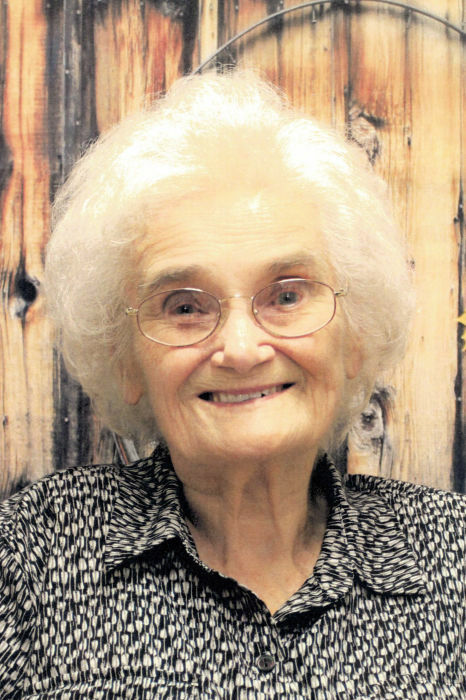 Opal Seber, 103, long-time resident of Guys Mills and later Meadville, peacefully left Wesbury on October 15, 2018 to join her Savior, husband John and many family members. She was born January 21, 1915 in Meadville, a daughter of Clyde A. and Cecelia M. Miner Beck. Her Aunt Anna helped raise her. After graduating from Oil City High School in 1933, she married John L. Seber in 1936 and started a family. They were married for nearly 75 years and he preceded her in death November 29, 2010. She was a long-time member of the Guys Mills Methodist Church and later Guys Mills United Evangelical Free Church where she held many positions including Sunday School and VBS teacher, Deaconess, Ever-Lea Missions Guild, and hand quilted with the Ladies Aid for many years. She was also a member and past president of the Guys Mills Women’s Civic Club, Guys Mills Senior Center, SewFine Ladies of Meadville and was proud to be honored as a life-time member of Free Spirit Quilt Guild in Saegertown. Survivors include four children, Harold Seber and his wife Kathy of Cambridge Springs, Marilyn Boyd and her husband David of Meadville, John Seber and his wife Janita of Erie, and Cheryl Weiderspahn and her husband Francis of Cochranton. Opal leaves behind eight grandchildren, Harold Seber, Jr, Judy Thorson and her husband Olaf, Gregory Boyd and his wife Aida, Jennifer MacKenzie, Jason Seber and his wife Stephanie, Jamey Owen, Merideth Riddle and her husband Brad, and Nathan Weiderspahn and his wife Barbara. Her fourteen great-grandchildren were the light of her life, Melissa, Darryl and his wife Miranda, Alexander, Elizabeth, Molly, Jacoby, Tucker, Gracia, Ruth, Lydia, Hope, Sarah, Isaac, and Evelyn. She was also loved by three great-great-grandchildren, Destiny, Serenity, and Justin; and numerous nieces and nephews. In addition to her parents and husband, John, she was preceded in death by a son, Allen Seber; a granddaughter, Brenda Boyd; a granddaughter-in-law, Nancy Seber; and a great-granddaughter, Adrianne Seber. She was also preceded in death by two brothers. Calling hours will be Wednesday, October 17th from 4-7 PM at the ROBERT W. WAID FUNRAL HOME, 581 CHESTNUT ST., MEADVILLE. The funeral service will be Thursday, October 18th at 4 PM at the funeral home with the Rev. Sam Marchetta, Chaplin of Wesbury United Methodist Retirement Community, officiating. Interment will be in Union Cemetery, Guys Mills. In lieu of flowers, donations may be made to the Cystic Fibrosis Foundation, 810 River Ave., Suite 100, Pittsburgh, PA 15212 or Wesbury United Methodist Retirement Community, 31 N. Park Ave., Meadville, PA 16335. The family wishes to express gratitude to Wesbury for years of care and devotion to Opal.